Special HIGH VOLUME nonrestricted couplers range from 1/4" to 1/2", and allow you to switch from one air tool to the next in seconds. Use 1/2" with abrasive blast equipment and 3/8" or 1/4" with air tools. Plated. 3/8" and 1/4" couplers are Type M. Pull-back safety feature connects and disconnects plug. When disconnected, coupler body stops air flow. Interchanges with most couplers. Body swivels to minimize hose twist and wear. Meets U.S. Military specs. 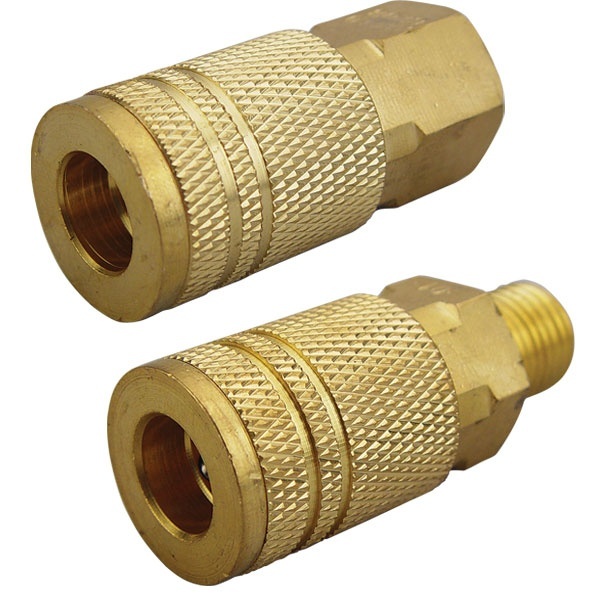 Female and male couplers are available in 3 standard sizes. 1/4" Female Pipe Threads, overall length 1-7/8"
1/4" Male Pipe Threads, overall length 2"
3/8" Female Pipe Threads, overall length 2"
3/8" Male Pipe Threads, overall length 2-1/8"
1/2" Female Pipe Threads, overall length 3"
1/2" Male Pipe Threads, overall length 3"
1/4" Male Thread Plug, overall length 1-5/8"